Is Old Fort Erie Haunted? Old Fort Erie sits on the bank of the Niagara river directly across from the city of Buffalo. The original fort was built in 1764 after the seven years war as part of a guard line for a supply system into the area. The fort was also a port which transported troops, passengers and goods as part of a line running from lake Erie up to the upper great lakes. The first fort was almost completely wooden, and suffered considerable damage during the winter months. However it still did its job and the British troops occupying it saw many skirmishes against the American loyalists who had settled in the area and the native Iroquois tribe. In 1803 authorization was given for the construction of a new fort and building began later that year. The new fort was built from local flint stone and had defensive embankments and thick wall's to withstand cannon fire. The fort wasn't quite finished when the American war of independence began and it saw more than its fair share of action. It was the site of the bloodiest battle in Canadian history and now rightly stands as a memorial. Today the site is open as a tourist attraction complete with re-enactments and museum. 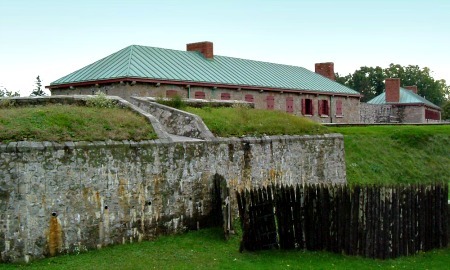 The fort is considered one of the contenders for the top spot of the most haunted place in Canada. Forts and castles never really have pleasant histories, being the site of battles and execution and fear. But this fort seems to stand out from your average one at the time, in terms of how haunted it is. There's pretty much every kind of paranormal experience to be had here, with tales of everything from EVP's to physical contact to seeing many different ghosts roaming the grounds. One of the most interesting things about the spirits here is that they all seem to be soldiers, and that they seem to appear in mass. There are more tales about seeing a group of soldiers then a single spirit, often described as being made up of a mist like formation. There are stories of them appearing in everything from line formation ready to fire their muskets, to groups of dying men who lay wounded on the floor. The most common areas to see such things is said to be the walls and the area closely surrounding the outside walls. The sounds of gun fire and even cannon has been heard by many visitors to the fort, often being described as sounding as if it were off in the distance, but still coming from the area of the fort. Sounds are probably reported as often as sightings, with EVP being captured on what seems like a regular basis. There is even a story about one of the ghost hunting teams who came to the fort. He was walking through one of the corridors in the building and was actually pushed to the ground by an unseen force. On the recording they captured a man saying in a rather gruff voice "get out of the way". The fort was featured on an episode of "Ghost Adventures" and remains a favorite for the area's ghost hunters, and rightly so.